Casa Neta offers more than 120 varieties of mezcal and tequila. FLATIRON — The owners of a new Flatiron mezcal bar knew they were onto something when a mezcal drink started outselling whiskey at their whiskey bar, according to a co-owner of the new venture. Casa Neta Mezcaleria & Tequileria, which opened on Thursday at 40 E. 20th St. between Park Avenue South and Broadway, is dedicated to exploring everything Mexico has to offer with mezcal and tequila, and includes more than 120 varieties of the spirits, according to Cody Pruitt, the bar's beverage director and a co-owner of Harding's, a whiskey-focused Americana bar nearby. 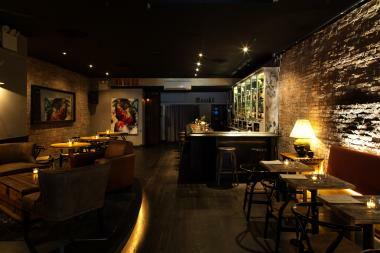 The aha moment came for Pruitt and his partners when they saw how quickly mezcal cocktails flew off the bar at Harding’s, located at 32 E. 21st St. between Park Avenue South and Broadway, which had previously only supplied bourbon and American gins. So Pruitt and his partners pounced at the opportunity to lease the new Casa Neta space, which they built out themselves with help from several local artists, whose contributions include a mural of Frida Kahlo and a large headboard emblazoned with a sugar skull. The bar seats 50 upstairs and another 20 in a downstairs room, and includes a menu of small-plate Mexican offerings such as tacos and ceviche. Harding's chef Joel Zaragoza crafted dishes to compliment mezcal bottles, Pruitt said. Mezcal and tequila — technically a variety of mezcal — come from the agave plant, a cactus that grows across Mexico. It is typically known for its smoky flavor and status as a sipping drink akin to good whiskey. The flavor of a given bottle varies from town to town — even if the same process or type of agave is used — thanks to subtle differences in the environment. The spirit can take on an earthier tone, have more floral overtones, or even taste something like blue cheese, Pruitt said. “It’s almost like wine in that it varies based on how you water the plants, how near they might be to a mountain, if they are on a mountain, if animals are grazing nearby,” he said. For some of the cocktails at Casa Neta, like the Oaxacan Old-Fashioned or the mezcal negroni, the bartenders simply replace the standard liquor with mezcal or tequila. But the menu also includes originals, including the “Oaxaca Sunscreen,” a mix of Del Amigo Espadin mezcal, horchata, coconut, fresh pineapple, lime and a splash of a Mexican variety of fernet. Casa Neta, located at 40 E. 20th St. between Park Avenue South and Broadway, is open from 5 p.m. to 2 a.m. Tuesday through Friday and at 6 p.m. to 2 a.m. on Saturdays.